The university’s sustainability efforts are driving down costs, improving efficiency, advancing transformative research, educating a new generation of leaders and ultimately helping create a better world. Browse the highlights or download full reports below to learn how our programs are engaging campus and community in preparing for a more sustainable future. 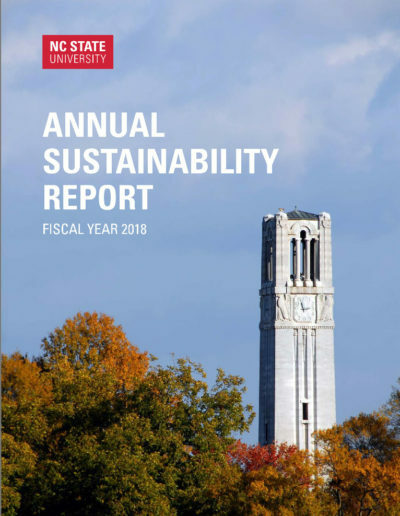 NC State’s Annual Sustainability Report is issued by the Campus Environmental Sustainability Team (prior to 2015) and the Sustainability Council beginning in 2015. An NC State Advanced Auditing class audited the 2012-2013 Annual Sustainability Report and summarized its findings and recommendations. Students in the spring 2015 course audited the 2013-2014 report and summarized its findings and recommendations. Students in the spring 2017 course audited the 2015-2016 report and summarized its findings and recommendations. Access NC State’s report in the Sustainability Tracking Assessment and Rating System (STARS) Report System, a national third-party sustainability reporting system that awarded NC State a Gold rating for sustainability. NC State University Dining wins Food Service Director’s Grand Goldie Award for its sustainability program, My Roots are at NC State. 2009 NC State included in the Peterson’s Review book Green Jobs for New Economy: the Career Guide to Emerging Opportunities.